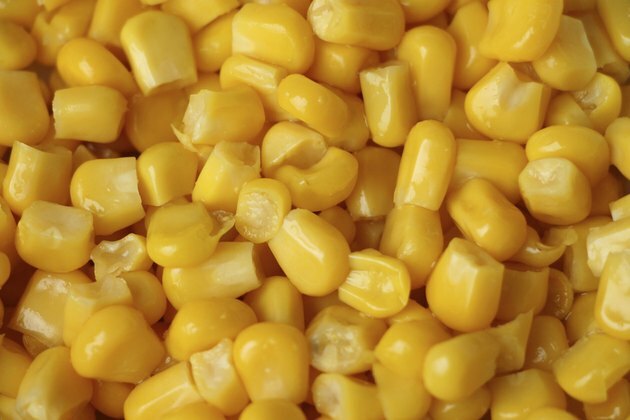 Fresh frozen corn adds color, texture and a natural sweetness to any meal. Most vegetables are frozen right after being harvested, as this is when their nutritional value is at its highest, notes the University of Maryland Medical Center. Boiling frozen corn fully immersed in water until it is soft is a great way to ruin that healthy start. However, cooking frozen corn is not complicated. With the proper method, or blanching, and careful timing, you can have a nutritious, delicious treat in minutes. Place a small to medium pot on the stove and fill it with no more than 1 or 2 inches of water. Bring the water to a rolling boil. It's important not to put enough water in the pot to completely cover the corn. Add the frozen corn. This method works with both corn on the cob and loose corn; just adjust the size of the pot so that the corn on the cob can cook in a single layer. Ensure that the water doesn't cover the corn; you don't want to boil the corn completely immersed in water. Keep the corn moving by stirring it or turning and rearranging it as it cooks. This keeps it from being fully immersed for more than a few seconds at a time, which helps preserve its texture, flavor and nutrients as opposed to boiling it fully immersed. Loose corn should be done in no more than three to five minutes. Corn on the cob can take up to five to seven minutes. Test for doneness with a fork. The corn should be tender but not mushy. Drain the corn into a colander and season it to taste with salt, pepper or whatever spice you prefer. Add chopped red and green peppers, onion and drained, canned black beans to loose corn for a quick and colorful side dish. Never overcook corn because its natural sugars will convert to starches, creating an unpleasantly mushy texture.